You don’t want to spend your money on mediocre slots and outdated fruit machines, right? We’ve composed a list of the top 5 slots you can refer to when you’re in the mood for the best possible spinning session you can have online. The games listed below are the crème de la crème of the fruit machine assembly available on the web, some of them with offer 99% return, so don’t make them wait! The true fruit machine has 3 reels and one paying line, but you don’t need to tell that to Microgaming. 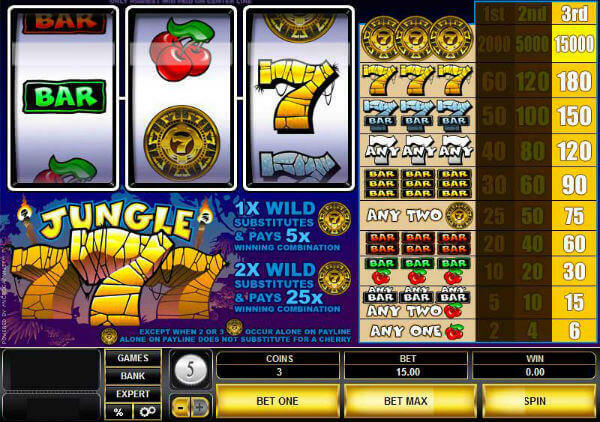 From the workshop of this leading provider comes the Jungle 7’s online slot, a worthy representative of the category with a refreshing jungle theme and vibrant visuals. In Jungle 7’s you’ll be facing a lot of the recognizable symbols such as the cherries, single bars, double bars and triple bars, as well as lucky sevens. There is one thing that may take you by surprise, and that is the existence of a Wild symbol, which is not very common in classic fruit machines. The coin is the Wild, and it will substitute for any other symbol on a payline. But that’s not all – one Wild in a winning combo will increase the win value 5 times, and two Wilds will add a 25 times multiplier to your won amount! The game allows you to bet up to 3 coins per spin, so make sure you adjust the coin size just the way you like it before hitting the Spin button. Mega Spin High 5 was developed by Microgaming, just like Jungle 7’s. 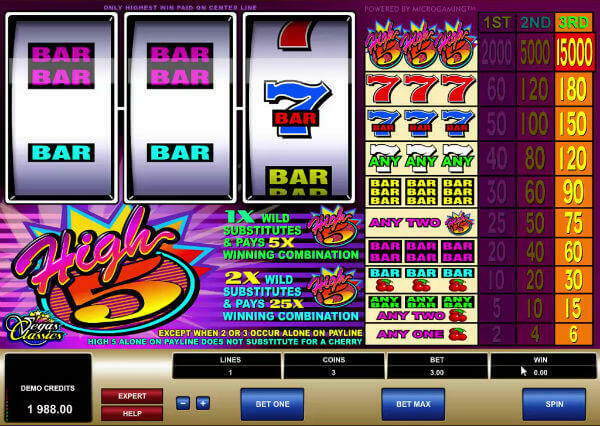 It can only be described as an extraordinary classic slot, since it offers the player a chance to experience unique gameplay. The most striking thing about Mega Spin High 5 is the fact that by clicking on the Spin button you don’t spin one set of reels, but multiple reel grids. As soon as you load the game, you’ll be given a choice of four, six or nine sets of reels. In its essence, Mega Spin High 5 is a classic fruit machine, so the symbols on screen will be the traditional cherries, bars and sevens. The only innovation, if we can call it that, is the addition of the High 5 logo in the role of a Wild card. The High 5 Wild can substitute all icons, only not cherries. Land three Wilds on a win line and enjoy a balance boost of 15,000 coins! Pick your preferred layout and start gaming – all it takes is one click of a mouse to set all those reels in motion. When you don’t want to be blunt and call someone ‘lazy’ you probably use the term ‘couch potato’. This humorous term served as inspiration for Microgaming and they made a whole slot out of it. The fruit machine has a classic style for sure, but the design takes it to a higher level – the logo shows a lazy potato on a couch, shuffling through the TV channels. If anything, the sight will give you a cackle. The game has 3 reels an 1 paying line, and it features symbols such as sevens, cherries and bars, as per usual. The TV set is introduced as a Wild, substituting all other game icons and thus helping create more matching combinations. What is more, it will multiply the win 5 or 25 times when it forms a part of the combo. 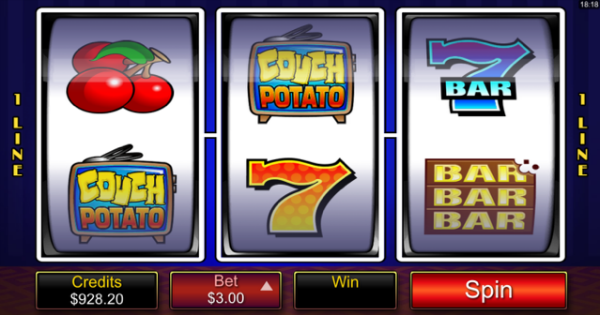 Couch Potato is a simple fruit machine, and a very lucrative one that will not have you feeling bored for one second. Jackpot 6000 is a treat for traditional slot game lovers, and it was developed by none other than NetEnt. The company found inspiration in the Norwegian slot machine called Jackpot 2000 but, of course, added something NetEnt-esque to it that made it an instant classic. Jackpot 6000 benefits from 3 reels and 3 rows, offering 5 win lines, which is a step forward towards the modern classic-style online fruit machine many online casinos are focusing on. The icons are colorful and appealing, from lemons, grapes and cherries to bells and golden stars. The Joker is a special symbol, which, if the game is played in Supermeter mode and there are two of them anywhere on screen, will provide a mystery payout. 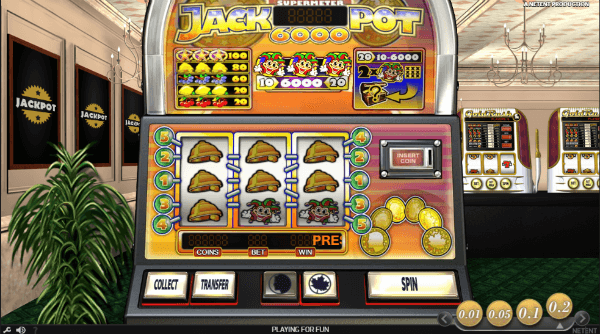 Jackpot 6000 is also equipped with a Gamble feature which becomes active after every win. That’s quite few ways to win for a classic fruit machine! 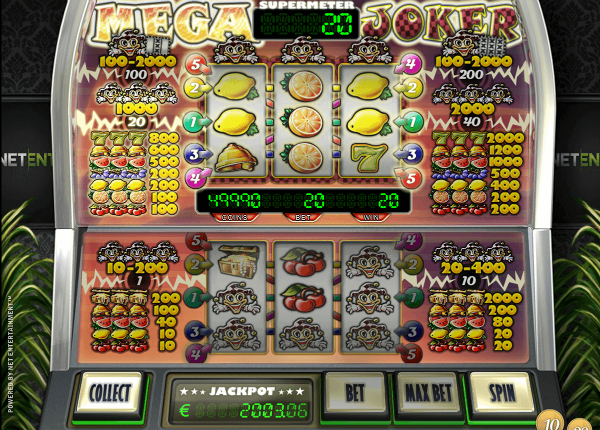 The Mega Joker slot is at the very top when it comes to NetEnt’s classic fruit machines. 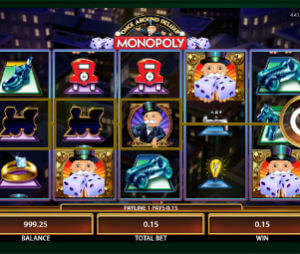 It comes with an impressive 99% RTP, a traditional layout and a progressive jackpot. There are 3 reels of symbols and a total of 5 win lines to make use of, but the juiciest part of Mega Joker gameplay are some bonus features that people don’t normally expect from old-school slots. The design draws inspiration from mid-80s cartoons and it gives the game a vintage feel. The symbols are typical: cherries, oranges, lemons, grapes, watermelons, golden bells and lucky sevens – and treasure chests. There are two sets of reels; the main game is played on the lower reels. Win in the main game and you can choose to go up and play in Supermeter mode where you can play bigger bets and earn bigger payouts. The Mega Joker progressive jackpot is awarded randomly, which means any spin could be the one that hits the chief prize!